Tony Taylor was a space cadet before there was a space program—meaning that his mind was in space while his body walked the earth. He decided early on that he wanted to be an astronaut. Fortunately, the space age came along with the launch of Sputnik in 1957 while he was still in high school, and his dream entered the realm of the possible. Knowing that astronauts usually start as pilots, he went to the US Air Force Academy, followed by pilot training, and eventually found himself flying 100 combat missions over North Vietnam through some of the best air defenses the world had ever seen. During that time, he became a war correspondent for his hometown newspaper. The articles he wrote would later lay the foundation for his first published novel, Counters, in 2008: a tale of young pilots, the Red Baron, and a collie named Sub-Lieutenant Sam. After returning home and spending a few more years in the Air Force, he resigned to go to graduate school at the University of Arizona in Tucson, finishing with an M.S. in Physics. These experiences equipped him, he believed, to follow through with his astronaut dream, which included becoming the first person to walk around on Mars. After several applications to NASA, followed by several rejections, he decided this was not to be, so he consoled himself with the next best thing: working at JPL (the Jet Propulsion Laboratory) and KinetX Aerospace, Inc. to navigate unmanned NASA spacecraft through the solar system. He visited (metaphorically) all eight planets plus numerous moons over the course of a thirty-year career, navigating spacecraft on projects Voyager, Cassini, Mars Polar Lander, Galileo, and MESSENGER among others. Tony is the first in history to have navigated spacecraft to every planet in the solar system. As a capstone, he also helped navigate the New Horizons spacecraft to dwarf planet Pluto. These experiences provided some of the underpinnings for his second novel, The Darkest Side of Saturn, in 2014: a story of an asteroid, a preacher, a reluctant prophet of doom, and a ballerina—things that naturally go together. His third novel, Black Sky Voyage, provides a vicarious substitute for his astronaut dream; instead of walking around on Mars, he writes of the first colonists on Mars in a tale that includes a president, a coup d’état, nuclear annihilation, and a polite alien. A scientific and objective realist, he nevertheless enjoys evoking the mystical in his novels, salting them with whimsical humor. 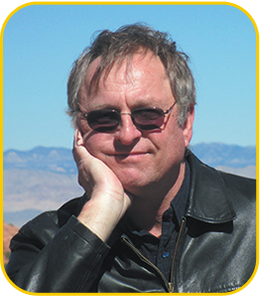 His published works have collected several honors, including the international Eric Hoffer Award First Place for Commercial Fiction; the Arizona Literary Contest Book of the Year; and Dan Poynter’s Global Ebook Award Silver Medal for Science Fiction. Tony lives with his wife Jan in Sedona, Arizona. He is proud of his two daughters and two grandsons. Between travels and tennis he hopes to produce a few more novels before launching his own black sky voyage into the great unknown. He may not be the only interplanetary navigator in Sedona—land of vortices and UFO enthusiasts—but he’s probably the only one who actually worked for NASA.